The lead gnolls launched spears at the elf and human that had dared to approach their shaman’s hut. Reflexes took over, Ludo sprung up from his prone position and darted off into the mist to give himself concealment from the marauding Gnolls. A spear collided into his side as he made his move. Despite the searing pain, he ran away from the where the rest of the party was gathered. “Go Ludo, Godspeed,” the elf whispered, as he dodged behind the hut for cover then crouched in a fighter’s stance. Through the mist, it was difficult to make out details about the approaching humanoids but for their large size. That and the sound of weaponry was all that Feldard needed however. He took aim at the lead figure and released his bolt. Then moving forward several steps, making a buffer of space between him and the mage behind. He reloaded his crossbow and fired again. At the speed the war party was approaching, he wouldn’t get another shot. As they got closer, it was apparent what they faced. Gnolls. He’d heard of gnolls, but this was his first time in battle against them. He suspected they might provide a good challenge. The dwarf grinned as he switched over to his battle axe and made ready to meet their charge. Stephan cursed himself for being so daft. “Morndu! Plalusha! My bow should have been ready!” Taking a position on Feldard’s right—but not too close!—he took on the first gnoll that reached him. “Morndu, what a stench,” the woodsman muttered as the first creature foolishly tried a frontal assault. To add to the beast’s error, it seemed to have over-looked shorter demi-human on his left. Feldard’s axe seemed hungry, but held back–not wanting to sever a limb from its fighting companion on the dwarf’s right. Maruc watched his friends charge into the fray. He was half tempted to follow them in, but there were quite a few of them and the small party could be easily outflanked. He decided to go the other side of the hut and went looking for the leader. He hadn’t forgotten the conversation earlier and the chances that there were some spellcasters about had not left him. He picked up a stone chip from the ground and made his way around as quietly as he could. The mist swirled and clung damply to his cloak, ahead it parted an gave him a glimpse of the gnollish warband. Their concentration caught by the rush of the warriors. Maruc looked for any that were especially large or had what would pass for priestly vestments in these parts. He was not familiar with gnollish culture, but it was quickly obvious that they were led by a shaman. Old and bald, her face and arms were deathly white, smeared with ash. Wearing a cloak made of human, orc and goblin skin, she leaped around, shrieking and waving a rattle made from an elf skull. His silence incantation would easily encompass the warband but not for long if they split into a general melee. He crouched behind a giant mossy slab. A stone bounced behind him and he spun mace in hand. He pulled the blow as he recognized Miklos. Summoning the power with a few confident gestures he thrust the web into the centre of the warband. Sticky threads sprouted and danced among the gnoll’s causing cries of consternation. Three of the dog-faced warriors were tangled up by the spell. “Now Mar…” silence engulfed him momentarily. As Maruc finished his spell, so did the shaman hers, with an ear-splitting howl that the priest could not hear while he held the silence stone. As he threw it at the group, the effects of the gnoll’s spell took hold. Maruc’s silence-empowered stone chip skipped to the feet of the the shaman and her ghastly screeching was cut off. She would not be casting any more spells for the time being. He picked up his shield, winked at Miklos. Miklos? Where had he gone? The priest looked down and saw his friend upon the ground. The mage looked up at the cleric. It was not the first time he had been paralyzed by an incantation. This particular gnollish flavor of spell was particularly uncomfortable. The shrieks and yelps frightened Hasan, but less than the outsized clubs and knives the great creatures swung. Hasan’s own first strike was faster, and he sliced through the arm of the first creature to reach him, but the great mass of the charging attackers was too great for the elf to withstand. There were well over a dozen of them. A snarling animal pushed him back from the hut, as he joined Maruc in making sure the gnolls would not get near their fallen friend. Concealed within the mist, Ludo slowed down. The gnolls had charged past the hut to fight the others, so he stealthily started to make his way back toward it. From within the mist the sounds of the melee were dull and confused, which suited Ludo, his approach to the battle was silent and swift. Holding his sword low he came up behind two Gnolls that were searching through the mist looking for targets to throw spears at. Ludo struck quickly, he stabbed his sword deep into the lower back of the first Gnoll, it yealped in pain and crumpled to the ground, Ludo then spun to the left and attacked the second Gnoll with a series of savage blows. This is all depressingly familiar, Miklos thought, as his muscles cramped up and he folded to the floor. To his certain knowledge every time they had encountered something with the ability to paralyse someone, he wouldn’t escape. He vowed that he would ask Maruc to pray to remove the curse from him. Hasan continued to fall away from the melee, his right lag dragging behind. “Watch their clubs,” the elf sighed to Stephan. “Poised or something. I never felt the like.” The elf pulled further away and turned. Summoning a bit of magical energy, he cast a dart at the wizened shaman. “Fare the well, madame,” the elf spat venomously, and drew his bow to follow the magical shot with arrows as fast he could shoot them. Feldard, ahead of the others, didn’t see Miklos collapse or Hasan fall back. He was surprised however at how resilent the gnolls were. There were few creatures he’d encountered thus far that required more than one blow of his axe to fell them but that only made this battle more exhilarating for the young dwarf. Feldard swung his axe down upon the injured gnoll with a fierce battle yell, intent on finishing it off before it could recover any. And with another bellow Feldard battled his way towards what appeared to be the leader. Stephan was strangely exhilarated by the dwarven battle yell. The demi-human was no longer overlooked by the gnolls but now was the focus of attention. The gnolls seemed to concentrate on the whirling bundle of muscle and axe. 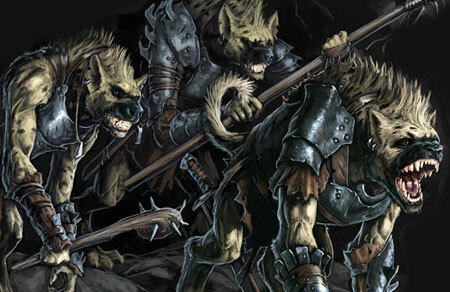 He noted Feldard’s fierce progress toward the gnoll leader and took up a position to assist. It was a great combination. As the gnolls stooped to strike the demi-human, they let their guard down and Stephan seized the opportunity to strike. Feldard clearly didn’t need the help but it did make the progress a little easier. Stephan soon felt like he and the dwarf were alone in a sea of gnolls. The hide on these beasts was thick! The Traladarian felt battle sweat under his helm. He could no longer assist Feldard as he had only seconds ago but they stood back to back now, stabbing and hacking in a fury.